Which human-powered floats will make it through the mud pit this year? A scene from the 2015 Kensington Kinetic Sculpture Derby and Arts Festival. On Saturday, May 19, watch as human-powered floats make their way through an obstacle course. Near the finish line, they'll face their hardest challenge: the mud pit. 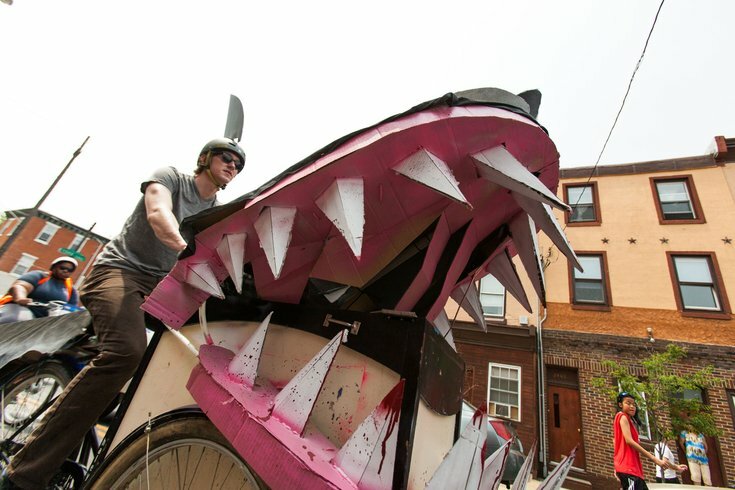 The 12th annual Kensington Kinetic Sculpture Derby will begin at noon. More than 25 derby teams will compete against each other, while spectators cheer from the sidelines. It's one of Philly's wackiest spring events, and worth seeing in person. The homemade floats will be judged in a variety of categories, including best engineering, best breakdown and best/worst pun. Attendees can expect to see some tricked out bikes and a variety of crazy costumes. Below is a highlight video from last year. Surrounding the finish line will be the Arts Festival, where more than 100 local arts vendors will be selling goods. In addition, more than 10 food trucks will be on-site to feed hungry festival goers. The derby and festival will take place rain or shine. For the exact parade route, click here.